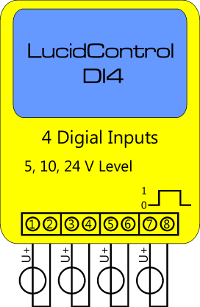 The figure shows the LucidControl USB Digital Input Module with 4 digital inputs (DI0 ~ DI3). All LucidControl USB IO modules have two connectors, the USB-Connector and the IO-Connector. Because of this the modules are very easy to connect and to set-up. While the upper USB-Connector is used for interconnection with the computer, the lower IO-Connector provides the interface depending on the modules function (e.g. digital outputs or analog inputs). The IO-Connectors of most modules have 8 terminals, two for each input or output channel. One exception is the DO4-S module which has 3 terminals per output channel and provides an IO-Connector with 12 contacts (illustrated in gray). Digital inputs have by nature only two states – they can be either LOW or HIGH. But the applied voltage range can vary from application to application. Because of this LucidControl DI4 modules are available for different voltage threshold levels. Table 2.1.1 shows the three threshold configurations and their input characteristics. All modules have a voltage range below VLowMax which is detected as LOW and a voltage range above VHighMin representing a HIGH state. The range between VLowMaxand VHighMin is forbidden by means that the state can not be determined correctly. For typical automation applications 24 V inputs are used often. When interfacing 24 V signals it must be ensured that in case of a LOW state a voltage equal or below 16 V is applied to the input. 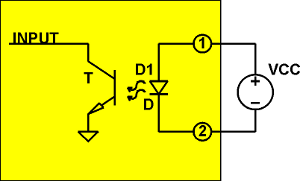 Detecting a HIGH state requires a voltage of equal or higher than 19 V. The range between 16 V and 19 V must not be used since the resulting state is not detectable correctly and is not allowed. Please see LucidControl User Manual for more information. 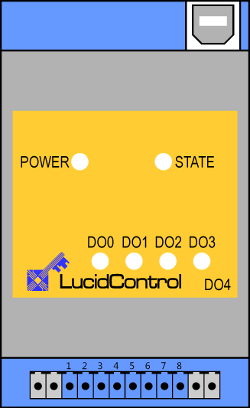 LucidControl DI4 is rated with a maximum current of 40 mA. The LucidControl DI4 USB Digital Input Module provides 4 opto-insulated and potential-insulated inputs. Figure 2.2.2-1 shows the interconnection of the module in a typical application. The input signals are represented by voltage sources with a voltage within the valid range depending on the selected threshold level. Fig. 2.2.2-2 illustrates the principle how the digital input works. The signal applied to the terminals 1 and 2 sources an opto-coupler which insulates the electronic of the module from the input signal. All inputs are floating by means that they have no common contacts (like ground) and are working independently. Applying a voltage above VHighMin between the input terminals 1 (resp. 3, 5, 7) and 2 (resp. 4, 6, 8) sources the LED of the opto-coupler and makes its transistor conductive resulting in a digital HIGH level. If the voltage is below VLowMax is applied this results in a LOW level. All inputs are protected against overvoltage. Applying a voltage higher than VInMax = 30 V may damage the input. All inputs are protected against faulty polarity. Applying a voltage lower than –VInMax = -30V may damage the input. After the module has been installed successfully (if it was necessary at all) the green power LED is switched on and signals that the module is ready for use. The module is preconfigured for Reflect Mode and it can be used without further configuration. The following examples demonstrate the functionality of the module by using the LucidIoCtrl command line tool. For all examples it is assumed that the module is connected to COM1. For all examples it is assumed that the module is connected to /dev/ttyACM0.